I graduated with my master’s degree in social work toward the end of my first year of marriage and was excited to forge these new journeys both personally and professionally. A connection made during my final semester of school led me to join the staff of Men Stopping Violence (MSV), an Atlanta based national organization working to engage and mobilize men to work to end men’s violence against women. Equipped with new tools, strategies and analysis, I was ready to tackle this complex issue. As I began my new role, I learned that I would not immediately start the work of program coordination, training, and teaching for which I was hired. I was told that I would be providing administrative support to the organization and to various programs, while I completed the 24-week Family Violence Intervention course, a key program of the organization. This class was set up for men who were referred by a court system, pressured by someone in their life, or, very rarely, decided on their own to address attitudes, beliefs and behaviors that they used to be abusive in their relationships with women. I found myself immediately uncomfortable, disappointed, and confused. I had never seen the need in my life for this type of experience. While I was in no way perfect, I did not believe I had done anything to warrant this examination of my relationships with women. However, in less than an hour into my first class, my understanding of our world was transformed. I now consider this course to be one of the most important experiences in my life. I quickly learned that patriarchal masculinity is the dominant narrative in our society on how to be a man, and it is defined by men’s superiority and control, particularly in relationships with women. I saw clearly that this philosophy, in some overt but mostly subtle ways, had taken root in my life. While I had not been physically abusive or significantly harmed a woman in my life, I was more similar to men in the class than I was different. My mostly unconscious commitment to patriarchal masculinity had restricted my relationships with women, preventing us both from accessing our full humanity. From that point forward, I began the difficult work of deconstructing this philosophy in my life. This led my partner and me to establish intentional ways to operate family life outside the rigid definitions of gendered norms. It led me to seek new relationships with men who were also engaging in this critical work of self-examination for mutual support and accountability. I became more involved and committed to engaging men locally and nationally through my work responsibilities at MSV and in my personal life. Then we had children. Two daughters. Once again, a magnified sense of urgency and accountability entered my life. This was not only related now to how I was in relationship to women in my life, most importantly my partner, but also how I began to relate and interact with these amazing female children who called (and continue to call) me Dad. What would they learn from me about how men should relate to women? Would they see a dad who could nurture, comfort, and care for them, or would they experience me as distant and unemotional? These are the choices I faced and continue to face as I work to overcome the teachings of rigid gender norms rooted in patriarchal masculinity. 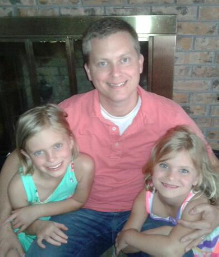 My daughters provide me with an amplified sense of accountability. I want to ensure my words and actions teach them that men should be in touch with our emotions, should be willing to take on whatever role is needed in daily family life, and should work in committed partnership with their mother. In addition, I want to convey that they are fully capable of engaging the world in a vast variety of ways. I want to highlight their creativity, humor, intelligence, passion, resilience, and compassion, and not lead them to believe that their physical appearance must be their primary asset. I don’t always get it right, but their presence in my life pushes me to work vigilantly to create a world for them that is wide open to whatever possibilities they can imagine and where relationships with men are defined by respect, support, and equality. That world doesn’t currently exist, but I will do all I can to answer to their accountability in bringing it to fruition.